The Quad Rock 50 crept up on me. Yes, I had been training for two months and I began to taper two weeks ago, but distractions have been constant during this time as I proceeded to get a doozy of a head cold and sinus infection about ten days out that knocked me down until the day before for the race. I was also wrapping up my soccer coaching commitments with our final game at 5pm on Friday. I left from the game to grab dinner and drive up to to the Fort. With that said, I arrived in Loveland at Jaime's in-laws (super nice folks) around 8:45pm and in time to chat for a bit and then hit the sack. We were both up a little after 3:00am and heading up to Lory State Park in the dark. The 45 minutes after we arrived whizzed by and before we knew it, all the 25 & 50 milers were crossing the start line and beginning their journeys. The morning was damp and cold. It had rained quite a bit the day before, but thankfully that didn't leave us with a muddy mess. The ground soaked up the precipitation and kept the dust down. The 50 mile race features two 25 miles loops. The second loop is run in reverse. There are benefits and drawbacks to this type of course. The benefits are that you know exactly what you're going to get hit with on the second loop, and you also get to see the leaders coming back at you and can figure out where you stand. The negative is that you know exactly what you're going to get hit with on the second loop and you contemplate that while you're standing at the finish line (aka the turn-around). Jaime ran the 25 in strong fashion finishing in 13th! I was aiming for 10 hours and was excited to finish around 9:23. I started writing out the play by play for the 50 mile race and got really bored reading it. There are so many people that have described the course in their reports much better than I can. Don't get me wrong, the race was awesome and probably one of my best. So I erased it all and decided to focus on why this race worked well for me. 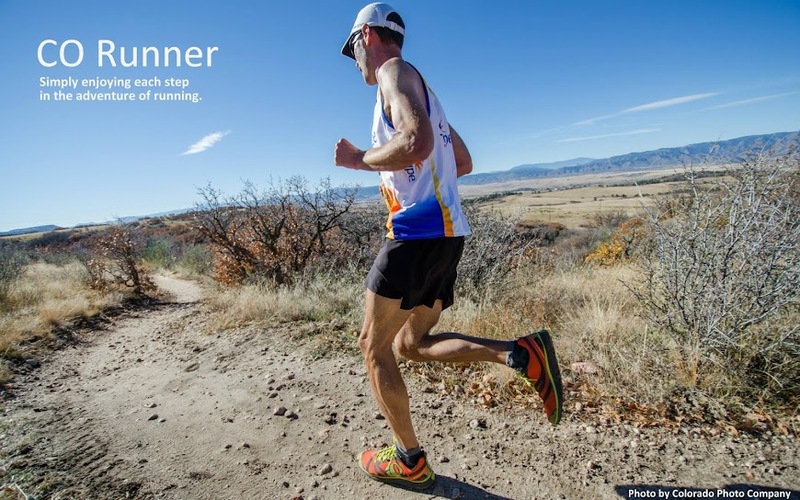 You'll hear me say "for me" many times coming up because I've learned the biggest mistake an ultrarunner can make, is telling another ultrarunner they're making a mistake. Everything in this sport is so personal and there is no cookie cutter approach to setting goals, training, fueling, race strategy, gear...you name it. 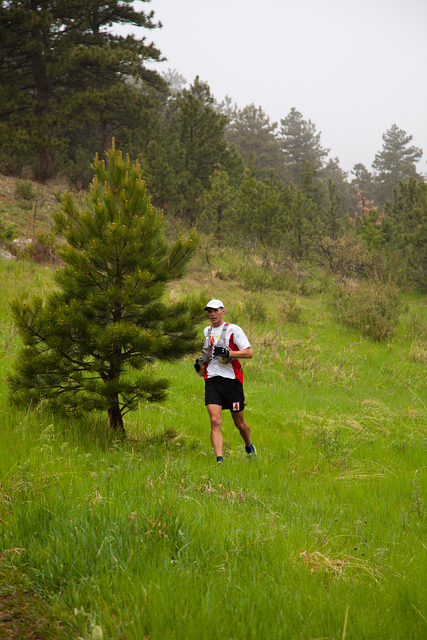 So after perusing a few pictures from the course, you can read my take-aways from the Quad Rock. Almost the end of the Towers Road climb. Lush green - wildflowers - and SNOW! Such a sweet sight after 50 miles - but depressing after 25. An awesome venue for the finish festivities. Too bad the weather didn't cooperate. Weather: Two of the my best road marathons have been in a cold & steady rain. I've yet to run an ultra in the rain, but this was as close as I've come. It was overcast and foggy all day. While it was chilly at the low points of the course, it got downright cold at the top. I started wearing a t-shirt with arm warmers. I thought the arm warmers were overkill until I got to the top of the Towers Rd climb and saw snow. These wild temperature swings continued all day with each incline/decline. While the arm warmers came off early, my gloves stayed on until mile 48. The sun is my nemesis in races, and I know these conditions kept the nausea I almost always experience at bay. EFS: I've used EFS Liquid Shots for over a year now. I like it much more than any gel on the market, but I stink at taking gels over the long haul in a race. I've tried mixing EFS in a 20 oz bottle, but that doesn't work because I crave plain water and don't like combining my calories & hydration. Thus, I had settled on taking the liquid shot straight and carrying it in the flasks. That has worked okay, but I still have a hard time getting it down late in a race when my stomach is unhappy. Well, I was stoked to hear that First Endurance was sponsoring this race and providing Liquid Shot refills at each aid station! So I tried something new. I carried a 10 oz bottle in the front pocket of my pack. At almost each station, a volunteer filled it with 4 oz of EFS and 6 oz of water. What an sumptuous concoction! I still carried water in my handheld, but the EFS went down smooth & quick all day and the energy I got from it was unlike anything I've experienced before. Getting these refills at the aid stations probably saved me $30 in fuel costs! Stinson Evo B's: I had just picked up a pair of these four days before the race (courtesy of a $50 gift card to BRC - which barely made a dent in the cost!) and ran in them three times totaling 13 miles. They are the best trail running shoe I've worn yet and decided to give them a go on Saturday. They did not disappoint. The foam is much firmer than the Mafates (not sure if the new Mafates use the same), so the "running on pillows" feeling is gone. They felt more responsive on the climbs, but the cushioning still did its thing protecting my feet from the rocks and letting me bomb the downhills with little regard for the terrain. I know Hoka's aren't for everyone, but the Stinson's are close to a perfect racing shoe for me. Up/Down: Despite the 11,500' of elevation gain/loss, I've realized a constant up & down course is much more suited for me than ones that feature more flat stretches. Each climb was 3-4 miles, and that was just the right amount of time for my muscles to get worked and be ready for the change. Again, if the sun was out, I'm sure I'd be saying something totally different. I also appreciated the low altitude compared to the dizzies I get when running in the mountains. Running Mindset: Once again, I ran without any splits in mind. With no pre-defined time to get to an aid station, I barely looked at my watch (no GPS). When I did, I couldn't figure out the math for how I was doing, so I just kept running. Keep it simple right? I ran this way at Moab (except I was chasing Todd & Joe the whole race) and loved the feeling of doing my best and letting the chips fall where they may. I know that I'm only arriving at this newly found freedom because I'm gaining experience with each year of running that passes and thus certain things are becoming more natural and require less thought. I'm not sure what to do about Leadville, because I know splits are important there for my crew. I also tried two new mantras which are too lame to share. But they worked well and helped pull me out of the moments of doubt I experienced. Nick & Pete did a bang up job for an inaugural race. The volunteers were stellar. This race will sell out much faster in the future. If you need a race to whip your climbing legs into shape for your summer season, this is the one. Awesome job Woody! you looked strong at the finish. Agree with everything you said, this is how a race should be run. Good luck at Dirty Thirty and see you at LC. Amazingly stout race, Woody! Especially considering I almost pushed you off a cliff! Based on where we crossed paths it seems like you came pretty close to running the second 25 as fast or faster than the first 25. Incredible! Well done, Woody! I really enjoyed this report (from the 'what worked for me' angle). You are putting up fantastic results, so it's cool to hear about some of the things that contribute to your stout finishes. Fantastic run Woody! Being a brand new race made it even easier to ignore and not even think about splits. I'm excited to see how all this training and experience will help you in Leadville! Great race, Woody! You are putting up some damn strong performances. Congrats! Todd - I really respect your training ethic and how you race. You motivate me to get better! Andy - I wish it was a negative split, but I'm happy that it only took an extra 40 min to complete lap 2. That's a big success in my book. Great job again on a strong 25! I'll be sure to take extra caution if I encounter you on Hope Pass! Haha! Chris - I like taking the transparent approach here. So many people have helped me along the way (including you!) that I feel it's fun to give back - not that many really care about my "sumptuous concoction." PG - That gave me a good laugh. Mike - Talk about a fantastic run - didn't you just crank out a 2:50 marathon less than two weeks before Quad Rock. Wow. And then an 8:49 at QR. You are in great shape for the WS100 my friend! JP - I have to admit the sting from the Bandera DNF is still stirring up motivation for me. Hope it keeps working. When can we go for a run? Seriously Woody, every time I looked over my shoulder you were right there. Regardless of my pace. Awesome work out there on Saturday. Can't wait for Lake City and the Elkhorn Resort! Soon! I'm out o' town this weekend, but around the next. How about a run from my house to the top of Mt. Evans? Early morning run at Mt. Falcon next week? Tracey - Seriously! It was an awesome course and if Andy wasn't pushing me off that cliff, I would have given you a hug! Haha! Congrats on 1st GM! Super cool. JY - Floyd's getting those posh cabins all ready for us! BT - See you at SJS! I want a higher finish out of you! JP - Love the Mt. Evan idea, but it may have to wait. We'll be out of town over the holiday weekend and then I've got GGD30 after that. Maybe the following weekend? How about Falcon next Thursday at 5am? Got Thursday on my calendar. Let's check in w/ one another next week. I think June 9 or 10 works for the H2E (Home to Evans) run. We can discuss next week. We'll make it a party. Sounds like a great plan Jim.